Replacement for up to 175W Shoebox Luminaire 44W LED Shoebox – produces 4,950 lumens Typical Energy Saving = 79% Annual Savings Estimate: $110.00 per year, per fixture Cost Savings based on $0.14 per KW – 13hour/day. Replacement wattages vary by manufacturer. Additional savings may be realized by adding motion sensors, photocell, dimming. Replacement for up to 250W Shoebox Luminaire 65W LED Shoebox – produces 8,025 lumens Typical Energy Saving = 78% Annual Savings Estimate: $153.00 per year, per fixture Cost Savings based on $0.14 per KW – 13hour/day. Replacement wattages vary by manufacturer. Additional savings may be realized by adding motion sensors, photocell, dimming. Replacement for up to 320W Shoebox Luminaire 90W LED Shoebox – produces 10,070 lumens Typical Energy Saving = 76% Annual Savings Estimate: $186.00 per year, per fixture Cost Savings based on $0.14 per KW – 13hour/day. Replacement wattages vary by manufacturer. Additional savings may be realized by adding motion sensors, photocell, dimming. Replacement for up to 400W Shoebox Luminaire 110W LED Shoebox – produces 12,000 lumens Typical Energy Saving = 76% Annual Savings Estimate: $233.00 per year, per fixture Cost Savings based on $0.14 per KW – 13hour/day. Replacement wattages vary by manufacturer. Additional savings may be realized by adding motion sensors, photocell, dimming. Replacement for up to 1000W Shoebox Luminaire 280W LED Shoebox – produces 34,500 lumens Typical Energy Saving = 75% Annual Savings Estimate: $545.00 per year, per fixture Cost Savings based on $0.14 per KW – 13hour/day. Replacement wattages vary by manufacturer. Additional savings may be realized by adding motion sensors, photocell, dimming. Replace 2 – 175W Shoebox Luminaires With 2 – 44W LED Shoebox – producing 4,950 lumen per luminaire Typical Energy Saving = 79% Annual Savings Estimate: $220.00 per year, per combo Cost Savings based on $0.14 per KW – 13hour/day. Replacement wattages vary by manufacturer. Additional savings may be realized by adding motion sensors, photocell, dimming. Replace 2 – 250W Shoebox Luminaires With 2 – 65W LED Shoebox – producing 8,025 lumen per luminaire Typical Energy Saving = 78% Annual Savings Estimate: $306.00 per year, per combo Cost Savings based on $0.14 per KW – 13hour/day. Replacement wattages vary by manufacturer. Additional savings may be realized by adding motion sensors, photocell, dimming. Replace 2 – 230W Shoebox Luminaires With 2 – 90W LED Shoebox – producing 10,070 lumen per luminaire Typical Energy Saving = 76% Annual Savings Estimate: $372.00 per year, per combo Cost Savings based on $0.14 per KW – 13hour/day. Replacement wattages vary by manufacturer. Additional savings may be realized by adding motion sensors, photocell, dimming. Replace 2 – 400W Shoebox Luminaires With 2 – 110W LED Shoebox – producing 12,000 lumen per luminaire Typical Energy Saving = 76% Annual Savings Estimate: $466.00 per year, per combo Cost Savings based on $0.14 per KW – 13hour/day. Replacement wattages vary by manufacturer. Additional savings may be realized by adding motion sensors, photocell, dimming. Replace 2 – 1000W Shoebox Luminaires With 2 – 280W LED Shoebox – producing 35,500 lumen per luminaire Typical Energy Saving = 75% Annual Savings Estimate: $1090.00 per year, per combo Cost Savings based on $0.14 per KW – 13hour/day. Replacement wattages vary by manufacturer. Additional savings may be realized by adding motion sensors, photocell, dimming. Replace 3 – 175W Shoebox Luminaires With 3 – 44W LED Shoebox – producing 4,950 lumen per luminaire Typical Energy Saving = 79% Annual Savings Estimate: $330.00 per year, per combo Cost Savings based on $0.14 per KW – 13hour/day. Replacement wattages vary by manufacturer. Additional savings may be realized by adding motion sensors, photocell, dimming. Replace 3 – 250W Shoebox Luminaires With 3 – 65W LED Shoebox – producing 8,025 lumen per luminaire Typical Energy Saving = 78% Annual Savings Estimate: $459.00 per year, per combo Cost Savings based on $0.14 per KW – 13hour/day. Replacement wattages vary by manufacturer. Additional savings may be realized by adding motion sensors, photocell, dimming. Replace 3 – 320W Shoebox Luminaires With 3 – 90W LED Shoebox – producing 10,070 lumen per luminaire Typical Energy Saving = 76% Annual Savings Estimate: $558.00 per year, per combo Cost Savings based on $0.14 per KW – 13hour/day. Replacement wattages vary by manufacturer. Additional savings may be realized by adding motion sensors, photocell, dimming. Replace 3 – 400W Shoebox Luminaires With 3 – 110W LED Shoebox – producing 12,000 lumen per luminaire Typical Energy Saving = 76% Annual Savings Estimate: $699.00 per year, per combo Cost Savings based on $0.14 per KW – 13hour/day. Replacement wattages vary by manufacturer. Additional savings may be realized by adding motion sensors, photocell, dimming. Replace 3 – 1000W Shoebox Luminaires With 3 – 180W LED Shoebox – producing 34,500 lumen per luminaire Typical Energy Saving = 75% Annual Savings Estimate: $1635.00 per year, per combo Cost Savings based on $0.14 per KW – 13hour/day. Replacement wattages vary by manufacturer. Additional savings may be realized by adding motion sensors, photocell, dimming. Replace 4 – 175W Shoebox Luminaires With 4 – 44W LED Shoebox – producing 4,950 lumen per luminaire Typical Energy Saving = 79% Annual Savings Estimate: $440.00 per year, per combo Cost Savings based on $0.14 per KW – 13hour/day. Replacement wattages vary by manufacturer. Additional savings may be realized by adding motion sensors, photocell, dimming. Replace 4 – 250W Shoebox Luminaires With 4 – 65W LED Shoebox – producing 8,025 lumen per luminaire Typical Energy Saving = 78% Annual Savings Estimate: $612.00 per year, per combo Cost Savings based on $0.14 per KW – 13hour/day. Replacement wattages vary by manufacturer. Additional savings may be realized by adding motion sensors, photocell, dimming. Replace 4 – 320W Shoebox Luminaires With 4 – 90W LED Shoebox – producing 10,070 lumen per luminaire Typical Energy Saving = 76% Annual Savings Estimate: $744.00 per year, per combo Cost Savings based on $0.14 per KW – 13hour/day. Replacement wattages vary by manufacturer. Additional savings may be realized by adding motion sensors, photocell, dimming. Replace 4 – 400W Shoebox Luminaires With 4 – 110W LED Shoebox – producing 12,000 lumen per luminaire Typical Energy Saving = 76% Annual Savings Estimate: $932.00 per year, per combo Cost Savings based on $0.14 per KW – 13hour/day. Replacement wattages vary by manufacturer. Additional savings may be realized by adding motion sensors, photocell, dimming. Replace 4 – 1000W Shoebox Luminaires With 4 -280W LED Shoebox – producing 34,500 lumen per luminaire Typical Energy Saving = 75% Annual Savings Estimate: $2180.00 per year, per combo Cost Savings based on $0.14 per KW – 13hour/day. Replacement wattages vary by manufacturer. Additional savings may be realized by adding motion sensors, photocell, dimming. Replacement for up to 175W Cobra Head Luminaire 45W LED Cobra Head – produces 4,950 lumens Typical Energy Saving = 79% Annual Savings Estimate: $110.00 per year, per fixture Cost Savings based on $0.14 per KW – 13hour/day. Replacement wattages vary by manufacturer. Additional savings may be realized by adding motion sensors, photocell, dimming. Replacement for up to 250W Cobra Head Luminaire 66W LED Cobra Head – produces 7,700 lumens Typical Energy Saving = 78% Annual Savings Estimate: $153.00 per year, per fixture Cost Savings based on $0.14 per KW – 13hour/day. Replacement wattages vary by manufacturer. Additional savings may be realized by adding motion sensors, photocell, dimming. Replacement for up to 320W Cobra Head Luminaire 88W LED Cobra Head – produces 9,000 lumens Typical Energy Saving = 76% Annual Savings Estimate: $187.00 per year, per fixture Cost Savings based on $0.14 per KW – 13hour/day. Replacement wattages vary by manufacturer. Additional savings may be realized by adding motion sensors, photocell, dimming. Replacement for up to 400W Cobra Head Luminaire 88W LED Cobra Head – produces 12,000 lumens Typical Energy Saving = 76% Annual Savings Estimate: $233.00 per year, per fixture Cost Savings based on $0.14 per KW – 13hour/day. Replacement wattages vary by manufacturer. Additional savings may be realized by adding motion sensors, photocell, dimming. Replacement for up to 1000W Cobra Head Luminaire 320W LED Cobra Head – produces 38,890 lumens Typical Energy Saving = 75% Annual Savings Estimate: $518.00 per year, per fixture Cost Savings based on $0.14 per KW – 13hour/day. Replacement wattages vary by manufacturer. Additional savings may be realized by adding motion sensors, photocell, dimming. Replacement for up to 100W Metal Halide or HPS 25W LED Wall Pack – produces 1,350 lumens Typical Energy Saving = 75% Annual Savings Estimate: $50.00 per year, per fixture Cost Savings based on $0.14 per KW – 13hour/day. Replacement wattages vary by manufacturer. Additional savings may be realized by adding motion sensors, photocell, dimming. Replacement for up to 175W Metal Halide or HPS 35W LED Wall Pack – produces 2,400 lumens Typical Energy Saving = 80% Annual Savings Estimate: $93.00 per year, per fixture Cost Savings based on $0.14 per KW – 13hour/day. Replacement wattages vary by manufacturer. Additional savings may be realized by adding motion sensors, photocell, dimming. Replacement for up to 250W Metal Halide or HPS 45W LED Wall Pack – produces 3,500 lumens Typical Energy Saving = 82% Annual Savings Estimate: $136.00 per year, per fixture Cost Savings based on $0.14 per KW – 13hour/day. Replacement wattages vary by manufacturer. Additional savings may be realized by adding motion sensors, photocell, dimming. Replacement for up to 320W Metal Halide or HPS 60W LED Wall Pack – produces 4,800 lumens Typical Energy Saving = 81% Annual Savings Estimate: $173.00 per year, per fixture Cost Savings based on $0.14 per KW – 13hour/day. Replacement wattages vary by manufacturer. Additional savings may be realized by adding motion sensors, photocell, dimming. Replacement for up to 400W Metal Halide or HPS 65W LED Wall Pack – produces 6,500 lumens Typical Energy Saving = 84% Annual Savings Estimate: $223.00 per year, per fixture Cost Savings based on $0.14 per KW – 13hour/day. Replacement wattages vary by manufacturer. Additional savings may be realized by adding motion sensors, photocell, dimming. Replacement for up to 70W HID Canopy Luminaire 25W LED Canopy – produces 2,500 lumens Typical Energy Saving = 73% Annual Savings Estimate: $46.00 per year, per fixture Cost Savings based on $0.14 per KW – 13hour/day. Replacement wattages vary by manufacturer. Additional savings may be realized by adding motion sensors, photocell, dimming. Replacement for up to 150W HID Canopy Luminaire 40W LED Canopy – produces 4,000 lumens Typical Energy Saving = 78% Annual Savings Estimate: $96.00 per year, per fixture Cost Savings based on $0.14 per KW – 13hour/day. Replacement wattages vary by manufacturer. Additional savings may be realized by adding motion sensors, photocell, dimming. Replacement for up to 175W HID Canopy Luminaire 52W LED Canopy – produces 6,200 lumens Typical Energy Saving = 75% Annual Savings Estimate: $105.00 per year, per fixture Cost Savings based on $0.14 per KW – 13hour/day. Replacement wattages vary by manufacturer. Additional savings may be realized by adding motion sensors, photocell, dimming. Replacement for up to 250W HID Canopy Luminaire 65W LED Canopy – produces 8,100 lumens Typical Energy Saving = 77% Annual Savings Estimate: $148.00 per year, per fixture Cost Savings based on $0.14 per KW – 13hour/day. Replacement wattages vary by manufacturer. Additional savings may be realized by adding motion sensors, photocell, dimming. Replacement for up to 70W Flood Light 18W LED Flood Light– produces 1,500 lumens Typical Energy Saving = 81% Annual Savings Estimate: $50.00 per year, per fixture Cost Savings based on $0.14 per KW – 13hour/day. Replacement wattages vary by manufacturer. Additional savings may be realized by adding motion sensors, photocell, dimming. Replacement for up to 100W Flood Light 21W LED Flood Light– produces 1,700 lumens Typical Energy Saving = 84% Annual Savings Estimate: $72.00 per year, per fixture Cost Savings based on $0.14 per KW – 13hour/day. Replacement wattages vary by manufacturer. Additional savings may be realized by adding motion sensors, photocell, dimming. Replacement for up to 150W Flood Light 39W LED Flood Light– produces 4,600 lumens Typical Energy Saving = 79% Annual Savings Estimate: $97.00 per year, per fixture Cost Savings based on $0.14 per KW – 13hour/day. Replacement wattages vary by manufacturer. Additional savings may be realized by adding motion sensors, photocell, dimming. 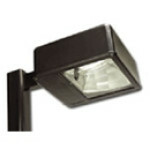 Replacement for up to 250W Flood Light 78W LED Flood Light– produces 7,600 lumens Typical Energy Saving = 73% Annual Savings Estimate: $140.00 per year, per fixture Cost Savings based on $0.14 per KW – 13hour/day. Replacement wattages vary by manufacturer. Additional savings may be realized by adding motion sensors, photocell, dimming. 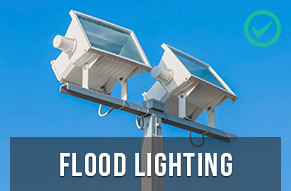 Replacement for up to 400W Flood Light 150W LED Flood Light– produces 14,500 lumens Typical Energy Saving = 67% Annual Savings Estimate: $206.00 per year, per fixture Cost Savings based on $0.14 per KW – 13hour/day. Replacement wattages vary by manufacturer. Additional savings may be realized by adding motion sensors, photocell, dimming. Replacement for up to 60W Incandescent Bollard 5W LED Bollard – produces 425 lumens Typical Energy Saving = 90% Annual Savings Estimate: $37.00 per year, per fixture Cost Savings based on $0.14 per KW – 13hour/day. Replacement wattages vary by manufacturer. Additional savings may be realized by adding motion sensors, photocell, dimming. Replacement for up to 70W HID Bollard 10W LED Bollard – produces 675 lumens Typical Energy Saving = 86% Annual Savings Estimate: $54.00 per year, per fixture Cost Savings based on $0.14 per KW – 13hour/day. Replacement wattages vary by manufacturer. Additional savings may be realized by adding motion sensors, photocell, dimming. Replacement for up to 150W HID Bollard 20W LED Bollard – produces 1,400 lumens Typical Energy Saving = 88% Annual Savings Estimate: $108.00 per year, per fixture Cost Savings based on $0.14 per KW – 13hour/day. Replacement wattages vary by manufacturer. Additional savings may be realized by adding motion sensors, photocell, dimming. Replacing 20 typical 400W MH/HID parking Lot Fixtures with LED replacements. 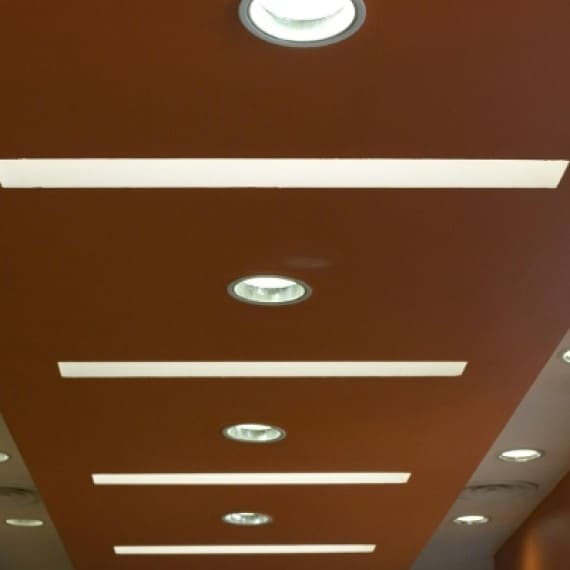 Here is a typical example of the savings you can expect from LED lighting, comparing 20 pole mounted (MH) luminaires to LED replacements. By simply switching over to LED lighting this project will reduce energy costs by more than 75% – Plus maintenance savings! With LED lighting technology lasting up to 10-years, maintenance savings can easily generate thousands of dollars. 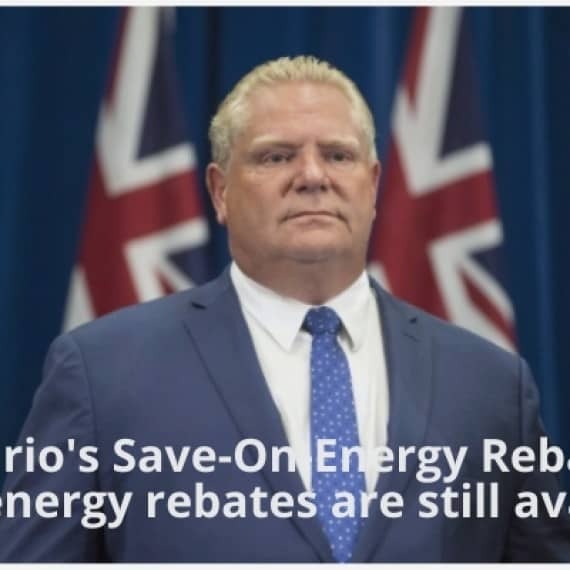 The bar graph to the right does not include cost avoidance (maintenance) savings. Conclusion: 75% Savings… Plus Maintenance Savings… Plus Dimmers/Sensors Could Add Even Greater Savings!